The port is right in the center. The colossal Venetian Fortress will greet you on one side and fine beaches on the left. The town still maintains its old aristocratic appearance, with its buildings dating from the 16th century, arched doorways, stone staircases, Byzantine and Hellenic-Roman remains, small Venetian harbor and narrow streets. (map) . While walking through the narrow streets, have a look at the splendid balconies: The ones made of stone are the ones from the Venetian era, the wooden ones show the Turkish influence. You can start walking at the Porta Guora, also called the Great Gate, at the entrance to Antistaseos Street. The gate represents the only remaining part of the ancient fortified wall of the town of Rethymnon. Continuing down Antistaseos St., which is also known as Mikri Agora (Small Market), you will find the church of Aghios. A Little Train tour start at the harbor and runs every hour from 10 am and is 7 Euro. Duration 30 minutes. This train covers the narrow streets of old town. Chania and the Samaria Gorge. 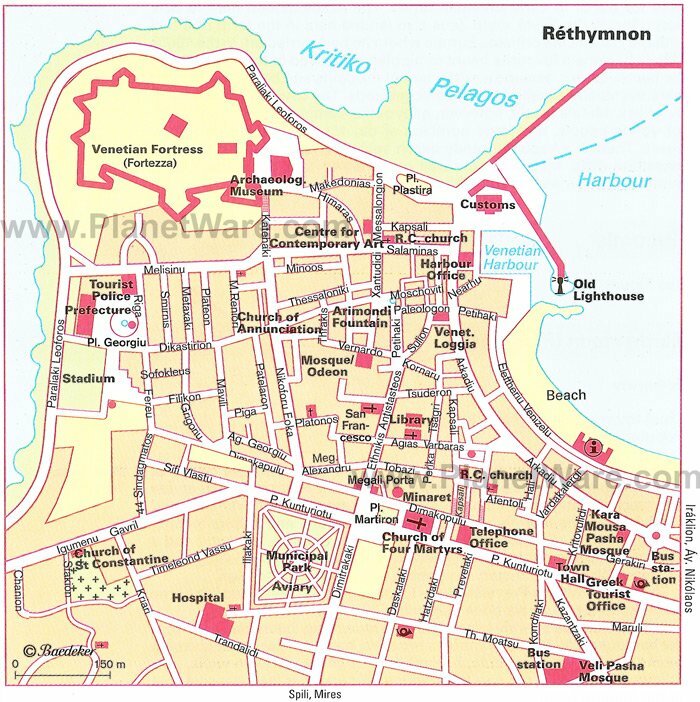 Rethymnon is the capital of the Prefecture of the same name and it is built between two other large cities of Crete. In the east is Iraklion (80 km) and to the west is Hania (60 km). It lies along the north coast, having to the east one of the largest sand beaches in Crete (12 km) and to the west a rocky coastline that ends up to another large sand beach after 10 km. Shopping is bountiful in Rethymnon. Kilometers of enjoyable shopping, upscale as well as more touristic in a neat and clean atmosphere. Restaurants and sidewalk cafes are plenty and in general are of high quality and due to the fierce competition are of good value and offer fine service.